July Wegweiser is ready to read! In the Newsletter column to the right is the "Wegweiser July 2017." Click on it to open the newsletter and enjoy! Read more about July Wegweiser is ready to read! Edelweiss is Gaufest-Bound: Off to Buffalo! Every two years, Gauverband Nordamerika holds a Gaufest. Edelweiss is one of about 70 Trachten and Schuhplattler groups in the US & Canada who belong to the umbrella organization called Gauverband Nordamerika (Gau-NA). This year's 4-day Gaufest--a convention of tradition and dancing--is being hosted by our sister club Edelweiss Buffalo in Buffalo, NY, the weekend before the 4th of July. About 1600 people will be attending, all in beautiful ethnic costume; 26 Edelweiss Detroit members will be among them. The weekend includes musical and dancing performances, interesting workshops, a banquet, and five different dance events with various bands. On Saturday afternoon before the big banquet, a beautiful mass is held, complete with beautiful live music and song by members of Gau-NA. Our own Edelweiss musicians are among those musicians and singers. Rick Michels, as Gau-Musikwart, is one of the major organizers of the musical portion of the mass, and he does a great job. On Friday morning, a competition for individual dance couples is held. This year 91 couples will be competing in 4 different age groups. We wish our competitors--Paul Schwalbe, Renee Edelhauser, Kevin Walker, Heather Hacker, Andrea Edelhauser, Roger Kraft, and Annette Edelhauser "Hals- und Beinbruch!" They've been practicing hard and we're proud of their abilities. On Saturday, about 15 different clubs will participate in a competition of group dancing (4-6 couples each). We're sad that we were not able to enter that competition this year, but it's great to watch the other groups dance, and we'll be there to watch and learn. 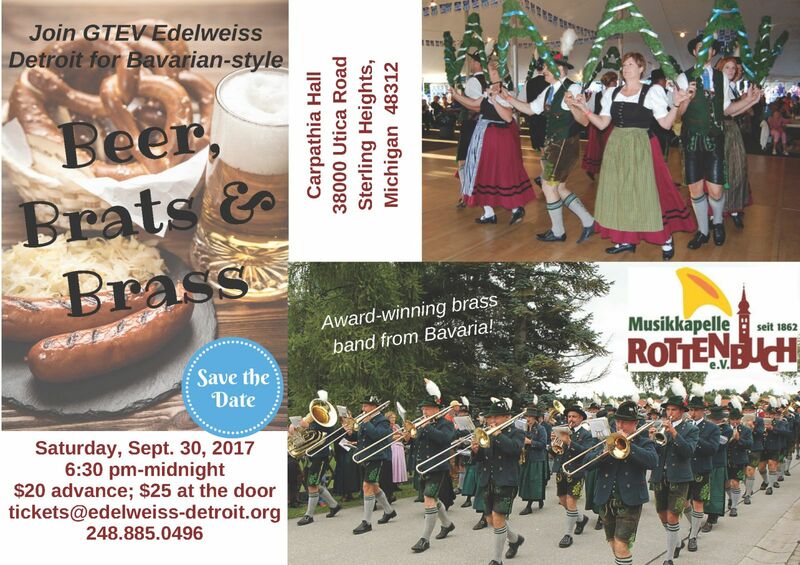 Other Edelweiss Detroit involvement in the weekend includes playing with the Gauverband Blaskapelle, a brass band made up of members from throughout Gau-NA, and participating in the Heimatabend and Boarischer Tanz with musical performances. Our Siasswasser Tanzlmusi will be playing for that dance on Friday night. What a treat--the floor is always filled with people who love learning, dancing, and teaching traditional folk dances, something we at Edelweiss are pretty passionate about. As we count down the days to our trek to Buffalo, our excitement grows. The four days will fly by, and then we'll come home sleep deprived, happy that we got to see so many of our friends from all over (including many who travel here from Bavaria! ), and renewed in our dedication to "Sitt und Tracht der Alten." Auf Geht's! Read more about Edelweiss is Gaufest-Bound: Off to Buffalo! March Wegweiser is Ready to Read! Click on the "March 2017" Wegweiser in the right hand column. Thank you to our editor, Michelle Uebrueck, for another interesting issue about our Verein! Read more about March Wegweiser is Ready to Read! At the January meeting, the members elected the 2017 officers. While most incumbents were reelected, a couple decided not to run. Ticket Obmann Renee Edelhauser and Bar Obmann Jim Green did a fine job for the last few of years, and we appreciate their work. Sharon Walker is our new Ticket Obmann and Dennis Hoshield will be taking over as Bar Obmann. Thanks to all for stepping up to fill the offices that keep our club running! Here's a picture to enjoy! (Do you like the ladies' new aprons? They made their debut at the February meeting!) Read the names and offices of all the committee members by clicking on Home/Officers. Dates for upcoming Edelweiss events in 2017 have all been added to the Upcoming Events list on the right side of the screen. 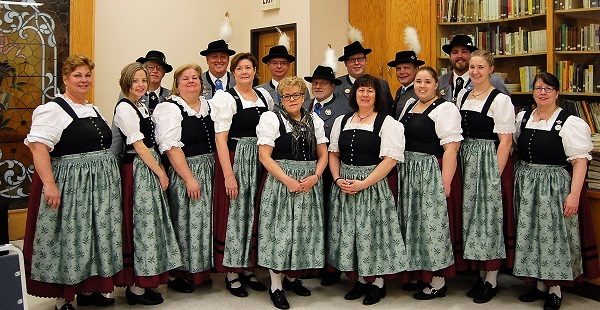 There's the usual dance practices and meetings, but there's also the Bezirksfest in Milwaukee, the Gaufest in Buffalo, NY, and our "Beer, Brats & Brass" Bavarian Night with our friends who are coming from Rottenbuch. The 40-piece brass band is fantastic -- they've played at the Munich Oktoberfest, all over Bavaria, and multiple times in the U.S. They'll be our guests here for a few days (anyone want to host a couple of guests?? ), play for us on Saturday, then leave for Los Angeles to play for another Bavarian club there. Every time we've hosted Rottenbuch here, we've had a blast and made long time friendships. We from Edelweiss have visited our friends in Rottenbuch a number of times, as well, always leaving with terrific memories. Read more about 2017 Will be a Great Year!